"It's a real test of our sentencing regime," said Quaid. "This is sort of the nightmare scenario where you have a mixture of ... factors that point in different directions if you look at our sentencing law." Judge Inez Cardinal's task will be to find a sentence that strikes a balance between the consequences of the offence and the blameworthiness of the offender, said Quaid. While Sidhu pleaded guilty to dangerous driving, it was not a hit and run, he wasn't impaired, nor was he speeding, or texting and driving, Quaid noted. "On the one side you got terrible consequences. On the other side you have a mistake that is not the worst of the mistakes," she said. "It doesn't seem proportionate to his moral blameworthiness," said Toronto criminal defence lawyer Daniel Brown. "It doesn't seem proportionate to his actions." "How do we deter other people from missing stop signs?" Brown said. "He wasn't distracted by his cellphone," he said. "He simply missed the traffic signal." Both Quaid and Brown said another significant factor Cardinal must weigh is Sidhu's guilty plea. "This is a person who has exactly the reaction that we hope ... every person convicted or found guilty of a crime would have — to have this deep reflection, this absolute acceptance of responsibility," Quaid said. MELFORT, Sask. 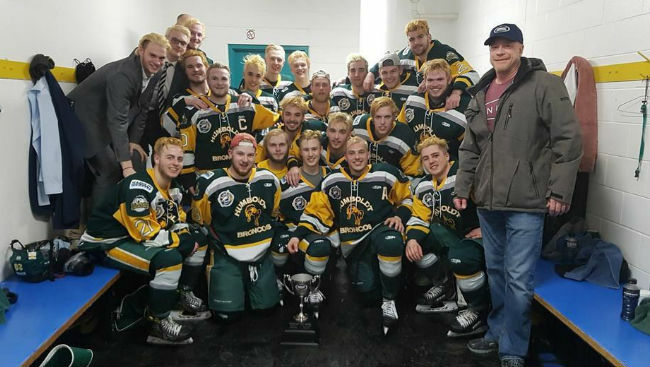 — The father of a player killed in the Humboldt Broncos bus crash says he thinks meeting face-to-face with the truck driver who caused the collision was a powerful moment in both of their lives. Scott Thomas, whose son Evan died in the April 6 crash, said both he and Jaskirat Singh Sidhu cried when the two met privately at Sidhu's sentencing hearing this week. "It was a very powerful, very emotional 15 minutes," said Thomas. "There were lots of tears on both our parts. "He said exactly what he said in court ... 'I'm sorry, I'm so sorry, I'm so sorry, I'm so sorry.'" Thomas was sitting in court in Melfort, Sask., Wednesday when Sidhu's brother tapped him on the knee and asked if Thomas would meet with their family after the hearing ended for the day. "We went into a small room in the back," Thomas told The Canadian Press in an interview Thursday. Thomas had frequently said he would like to meet with the truck driver. He said Sidhu asked him how he could make it right for his family. "I said, 'So far, you've done everything that's in your power,'" Thomas recalled. "He pled guilty, he took away the possibility of a long, drawn-out trial. He ended the proceedings in a pretty short and quick and efficient manner and definitely saved our families a lot of grief going forward. "In his words, he can't do anything to make it better, but he can stop proceedings that make it worse. That's what he did. He's already taken steps in that direction." Thomas said he accepted Sidhu's apology. "Absolutely," said Thomas. "It was a powerful moment in both of our lives, I think. It's what I had asked for." Ninety victim impact statements were submitted from family members over three days. They cried as they spoke of their unending grief for those who died and their frustration for those forever scarred. Some said they can forgive Sidhu, while others said they are too angry. Crown prosecutor Thomas Healey told court that he admired the ability to forgive, but that actions must have consequences. He said that while there has been no case like it before in Canada, a sentence of 10 years with a 10-year driving prohibition would be appropriate. The defence made no specific sentence recommendation but cited other dangerous driving penalties stretching from 1 1/2 to 4 1/2 years behind bars. Thomas said he wouldn't want to be in the judge's position of having to determine Sidhu's sentence. "There's definitely some parts of our conversation I am still not talking about, but the range of human tragedy in this is unbelievable," said Thomas. "Any time I think I can't get any deeper into this, something happens to continually break my heart." Sitting through the victim impact statements was sometimes harder than the days after the crash, he said. "A couple of Mr. Sidhu's family members were in the meeting with us and you could see the pain in their faces. So many families on so many levels. "From the 29 people on the bus to the billet families to the first responders who were there. There's thousands and thousands of people who were impacted by this and every one of them has a unique story. It's unbelievable." Thomas said his strongest feelings in the case are reserved for a system that allowed Sidhu on the road with little experience and even less training. "If I harbour long lasting hard feelings toward anybody it's toward the company that employed him ... the trucking industry that allowed this to happen and the governments that allowed a man like him to be behind the wheel," Thomas said. "I have a horrible feeling there are hundreds of others who are trained just as poorly out on the road right now. He thought he was just doing his job." Provincial court Judge Inez Cardinal said she will hand down her sentence March 22. "However this happens, there's no winners here," said Thomas. "There's going to be losers. No matter how that decision comes down, a whole bunch more people are going to lose." MELFORT, Sask. 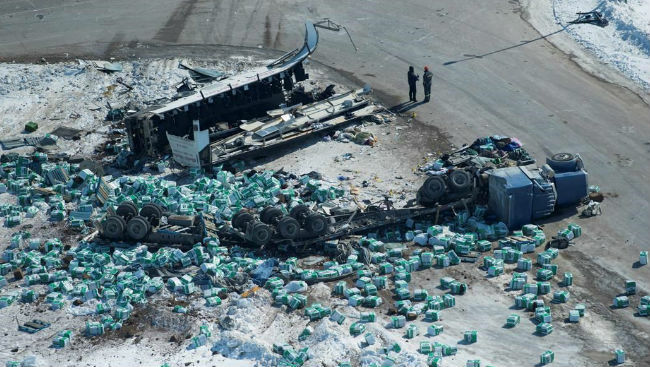 — The truck driver who caused the deadly Humboldt Broncos bus crash stood silently for a moment, steadied himself with his hands on a table, then took responsibility for killing 16 people and injuring 13 others. "It happened because of my lack of experience and I'm so, so, so, so sorry," Jaskirat Singh Sidhu said Thursday in front of dozens of the victims' relatives in a Melfort, Sask. courtroom. The 30-year-old told the families he can't imagine what they are going through and realizes he took "the most valuable things of your life." Provincial court Judge Inez Cardinal heard lawyers argue for sentences ranging from 1 1/2 years in jail to up to 10 years in prison. She said she will hand down her decision March 22. The judge was told that Sidhu was an inexperienced driver, travelling for the first time in a rural area near Tisdale last April, when he barrelled through a stop sign and into the path of the oncoming bus carrying the junior hockey team to a playoff game. The bus was torn into three pieces and the rig, carrying two trailers loaded with bales of peat moss, flipped onto its side. "I came out of the truck and I heard the kids crying," Sidhu said. "It took me time to see, realize that it's a bus. "I can't ever imagine what you guys are going through ... I take full responsibility for what has happened." Several family members in court hugged each other before they quietly left the courtroom. Scott Thomas, whose son Evan died in the crash, wasn't in court for the apology. But he said he is not surprised that Sidhu turned to look at the families because he had a similar face-to-face experience when he met with Sidhu Wednesday. "It was a very powerful, very emotional 15 minutes," he said. "There were lots of tears on both our parts. "He said exactly what he said in court today: I'm sorry, I'm so sorry, I'm so sorry, I'm so sorry." Thomas said he accepted Sidhu's apology and told him he had done the right thing by pleading guilty in January. "He took away the possibility of a long, drawn-out trial," said Thomas. "It definitely saved our families a lot of grief going forward." Sidhu pleaded guilty to 29 counts of dangerous driving before the sentencing hearing in a makeshift courtroom at an event centre gymnasium. Crown prosecutor Thomas Healey told court that he admires the ability to forgive, but that actions must have consequences. He said that while there has been no case like it before in Canada, a sentence of 10 years with a 10-year driving prohibition would be appropriate. Healey described how Sidhu was travelling between 86 and 96 km/hr when he passed four signs informing him of the upcoming intersection before he came across an oversized stop sign with a flashing light. He said Sidhu should have seen the busy highway coming up in front of him or the car stopped across the road that was waiting for the Broncos bus to pass. "How do you miss that? It's just astounding," Healey said. "All he had to do was stop. That's all." "This was more like a rocket," he said. "There was nowhere for the bus driver, Glen Doerksen, to go." Court heard Doerksen did brake but had no time to avoid the truck that was blocking all lanes of traffic. "This wasn't just an accident," said Healey. "This was a crime." News of the crash made headlines around the world and people across Canada responded by pulling on sports jerseys and leaving hockey sticks on porches to honour those on the bus. One of Sidhu's defence lawyers, Glen Luther, told court he has been touched by the tragedy himself. "My hockey stick remains outside my door." But he said it does not fit among the worst dangerous driving cases. Mark Brayford said he knows the victims' families have been asking why his client went through the stop sign. "I'm disappointed to say that I can't tell people what happened," he said. "He simply doesn't know. "He beats himself up everyday. 'Why didn't I see the signs? Why didn't I stop?'" Brayford said Sidhu immigrated from India five years ago and, three weeks before the crash, was hired by a small Calgary trucking company. He spent two weeks driving with another trucker before heading out on his own for his first time in the area near Tisdale. About 15 minutes before the collision, Sidhu stopped to adjust tarps covering his load. As he headed toward the intersection, he was still focused on the tarps and was looking in his rear mirrors, said Brayford. He said Sidhu didn't see the intersection and he didn't see the bus. Brayford added that there's no evidence Sidhu deliberately chose to blow through the intersection to save time, otherwise he would have been charged with criminal negligence. Brayford also said that any sentence over six months would likely mean his client is deported, because he is not a Canadian citizen. A few months after the crash, the federal government changed the Criminal Code, increasing the maximum penalty for dangerous driving causing death from 14 years to life in prison. It also increased the maximum sentence for dangerous driving causing bodily harm from 10 years to 14 years. The Crown noted Sidhu must be sentenced under the previous law. WINNIPEG — A jury has found a passenger guilty of second-degree murder for stabbing a Winnipeg transit operator who had removed him from a bus.